Starting with the head lamps which are an all new feature in this car, there isn’t much to differentiate the old and new C-Class’. Also, this is no small upgrade to the head lamps. Like most of the North American cars and also European, now Indian, the new C-Class gets a blue tinge in the head lamps. Replacing the fog lamps are a string of LEDs. The bonnet has been lowered a bit in the interests of pedestrian safety while the air intake has also been widened. The 17 inch wheels carry on with the old alloy wheel pattern and the boring wing mirrors are also carried over from the older model. A panoramic sunroof is part of the standard equipment and towards the rear, new S-Class like tail lamps with the integrated indicators make their debut. Most of the Mercedes cars that we get to India go to the Indian accountant’s office before they actually start selling the vehicle. The good times have come as this model looks straight out of the US show room and is packed with features galore. This is no nip and tuck job and can be called as a true facelift. What obviously hasn’t been changed is the all in one steering column which has got the stalk columns to control the indicators, head lamps, wipers and also the cruise control. Not to mention the audio and Bluetooth telephony as well. However, the seats are now all electrically adjusting (front seats) and also mirrors which retract electrically with a cabin which exudes class. Compared with its competition, the C now feels at par rather than being branded as a car with less features. The layout of the dashboard and central console also feels an all new thing. The front seats were comfortable, however the rear ones were just as comfortable or not as the competition. The central hump towards the rear means that the middle passenger is unwelcome. Boot space hasn’t changed from the previous version and the seats still don’t split. Everything feels well screwed out here though. Usually Mercedes cars are front wheel drive with the same old accountant story revisited. However, this new version makes do without the cost cutting things. In comes the rear wheel drive version which is any enthusiast’s manna. According to the moods, one can vary the suspension to Comfort or Sports. By default, it lies in the Comfort mode. Changing it to Sports only revealed a slight stiffness from the suspension, which by the way, is setup to be in the soft zone. Pushing the car through bends in the Comfort mode as also Sports mode revealed that there ain’t much difference. The steering wheel remains light for most of the affair and only in the Sports mode does it weigh up a bit. Unlike the 3 series, there is body roll to contend with and also the A4 handles better. However, we felt that the new C has some spring in its step whatsoever with the lack of any mechanical feedback from the chassis as also the steering wheel. Ride quality is the forte of this car and it gobbles up potholes and the likes with considerable ease. The ride height also didn’t pose much problems with the city’s speed breakers. NVH is also handled nicely and its only at the top of the rev band that this car becomes somewhat fidgety with the noise insulation thing. The engines are carried over from the 2010 model and that means there are two diesels and two petrol ones. We had the chance to review the 1.8 liter turbo petrol. This particular unit with its 4 cylinder head makes 186 Bhp of power and torque of 285 Nm. Making its debut is an all new 7 speed auto transmission unit which gets this car racing from 0-100 kmph in 8.4 seconds. The top speed that we achieved was a cool 204 kmph. The engine is an eager unit and coupled with the new transmission unit, more than makes up for the lack of Bhps. The absence of turbo lag is also a boon. The diesels should also be fun to drive units knowing their earlier behaviors. As for the transmission, it is a sweet shifting unit with no paddle shifts to contend with. Thankfully enough, no E-Class type gear shifter is provided on the steering column. The traditional gear shifter looks and feels good. BlueEfficiency has now become the mantra across the range and even the entry level model gets it. As for the fuel efficiency, we managed 7.8 kmpl in city conditions while the highway driving saw it climb to 10.2 kmpl. That coupled with a 66 liter fuel tank means that there would be long gaps before the tank has to be refilled. A full complement of electronic aids like ESP, traction control, ABS and EBD are also available. That coupled with the 6 airbags on tow offer some sense of security. 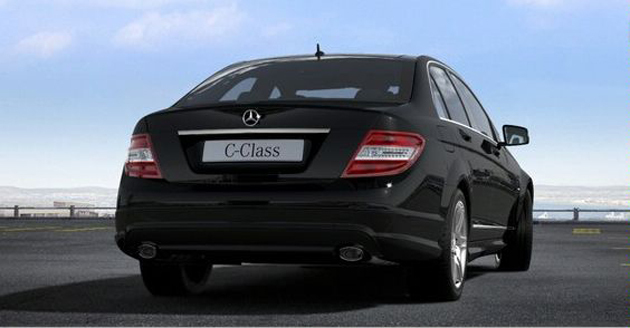 The 2011 Mercedes C-Class in India is the bread and butter model for MB. It has got the stately 3 pointed star which more than compares with its competition. Now with the number of increased features, it more than stands up a chance of bringing up the Mercedes brand up against its other German rivals namely Audi and BMW. We would have liked a bit more of communication from the steering wheel as also the entire chassis. Some more poke in the entry level engine also would have done wonders. 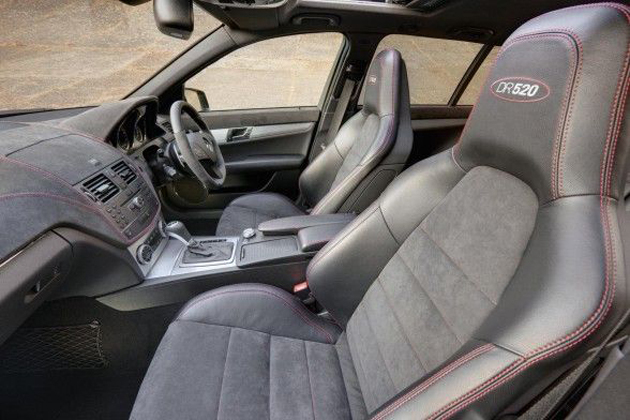 A bit more of leg room at the rear would also have been preferred. As with the other manufacturers, even Mercedes have brought in their BlueEfficiency tag to the starting series as well. Mercedes have a wider dealer network as also sales and service part than its counterparts. 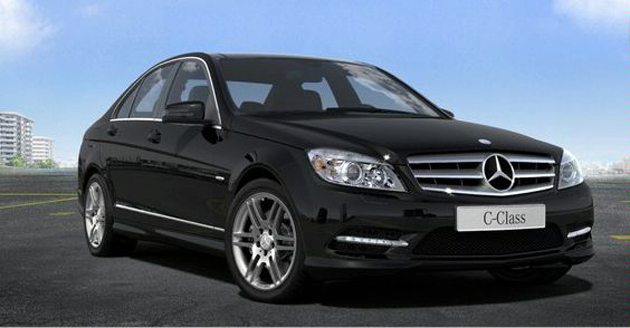 The 2011 Mercedes C-Class price in India starts from Rs 29.79 lakhs and goes all the way to Rs 32.30 lakhs for its diesel engined variant. The company has preferred to go backwards with the pricing as supposedly the older and newer C-Class variants have a price difference and one which does away with the norm of pricing newer vehicles more than their old variants.